Jerri Wilson of Loco is being recognized as a significant woman in Oklahoma agriculture. 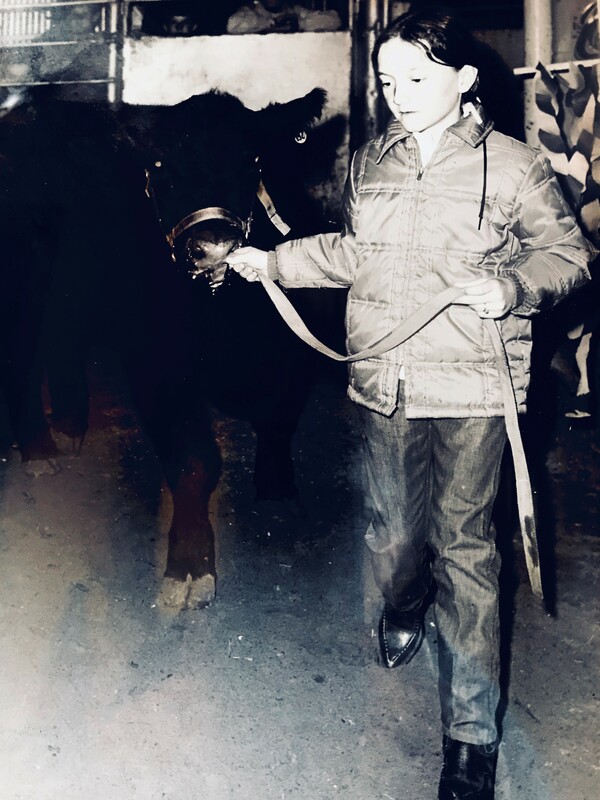 Jerri Wilson at 10 years old showing her home-raised Angus show steer. LOCO – Cattle and horses over people. Jerri Wilson, raised near Duncan in southern Oklahoma, made that choice about the time she was still shedding baby teeth. Horseback at every opportunity, Wilson would carry her lunch around in her saddle bags. Why? She was born to Billie and (Ed) John E Jackson, Jr. and grew up on the commercial Angus cow-calf ranch in southern Stephens and northern Jefferson counties. Ed Jackson purchased the ranch the year Wilson was born, 1959, and expanded it to 23,000 acres. Billie and Ed had four daughters. Their names started with J so it was called the 4J ranch. Wilson was the youngest and grew up following her father around taking care of the cattle. Wilson’s love for taking care of cattle and the land was not a secret. Everyone could see it. Add those round-trips up from grade school through high school and that’s a lot of miles. Not long after the bus came to a stop near their house, Wilson was out on her paint pony riding through the cattle and across pastures. As she got older, Wilson’s responsibilities grew. She worked cattle, took care of the cattle and horses, and doctored the sick ones. Wilson also began showing cattle at the county and state level. At 13, she showed heifers, but they had to be registered. Lowery gave her a heifer every year through high school as payment for helping him with his cattle. Lowery kept little breeding books, with a rubber band around them, on his dusty dash. Wilson studied those little books. “I built my first herd with those registered Herefords and still have a little Hereford patch for sentimental reasons,” Wilson said. One of her other passions was livestock judging and grass identification. She went to numerous contests and loved all the aspects of learning. 4-H was a big part of her life, and the horses she took to 4-H and Quarter Horse events were not only for showing. “They were also my cow horses back on the ranch,” Wilson said. In high school, she started going to the state high school rodeos. That’s where she met her future husband Bob Wilson. The two married after high school, in June, 1977. As her Dad was getting older, he had heart problems, so Bob and Jerri returned to Ed’s ranch where they lived and worked. The Wilsons had three daughters, Kristy, Kerri and Kayla. When Jerri Wilson’s father passed away, the family dispersed the ranch and cattle. Wilson, 30 years old at the time, and Bob, began their own ranching operation near Loco. They put together enough acreage to get a start, so they bought four loads of commercial Angus bred heifers. “As soon as that was done, he stopped,” she said. While he was gone, Wilson was feeding cattle and taking care of their first grandson. “By now our two youngest daughters were beginning to show cattle and loved it,” Wilson said. “It had changed dramatically from my days. Hair products and clipping were much different. There was a lot of learning to do. So, from artificial breeding the heifers, and purchasing some purebred and percentage bulls, they started breeding Simmental into their cow herd. 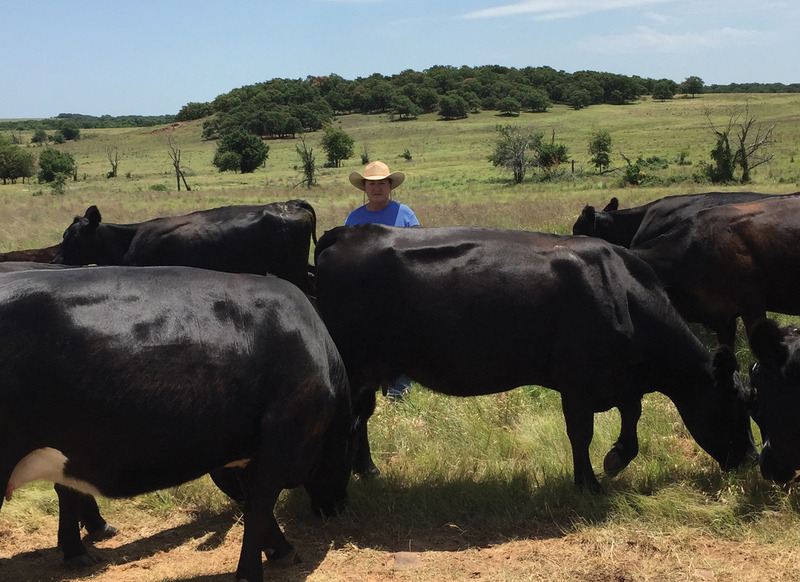 “Now we have a SimAngus cow base and have been breeding them to registered Angus bulls,” she said. During the fall of 2010, it seemed the Oklahoma skies had started to dry up. Rains became a dusty memory. Plus, in February 2011, Bob broke his wrist in a shop accident. A hired hand helped for about three years before moving back to Nebraska. Challenging decisions had to be made. “At the time, there was not enough water so the calves were taken off at 400 pounds and we sent them to a feedlot which is not what we normally do,” she said. “Normally our calves are left on the cows till they are 500 to 600 pounds. Over the years, Jerri and Bob have purchased more land and have doubled their size from what they started with, “which has been gratifying to improve those areas.” They have done a lot of clearing brush, sprigging Bermuda and weed spraying to improve the grass for cattle, while yet always being mindful of the wildlife. They are also mindful of the future. In addition to three children, they have six grandchildren.